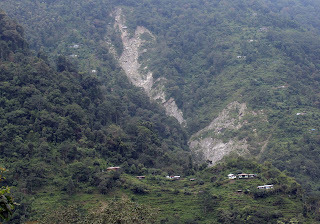 Residents of Lower Kholakham under Kalimpong Block 2 are spending sleepless nights fearing heavy showers and landslide menace like last year. Recalling those heartbreaking memories, people in the areas keep their eyes peeled when it rains. The 63 families of this area today narrated the story to the reporters. These families were shifted to 6 relief camps last year from July 1st to October as the area was hit by landslide after which the area was totally cut off from rest of Kalimpong. Narrating the story Sukradas Rai resident of Kolbung Kholakham told the area was washed by landslide which washed away many houses. Many leaders including GTA Chief Bimal Gurung , the then MLA Dr Harka Bahadur Chhetri , departmental officer came and assured of Landslide protection but the assuranace has not turned into Reality. As a result the last year landslide area has been increasing and the area has been sinking. The Sinking has developed recently many cracks in the houses . 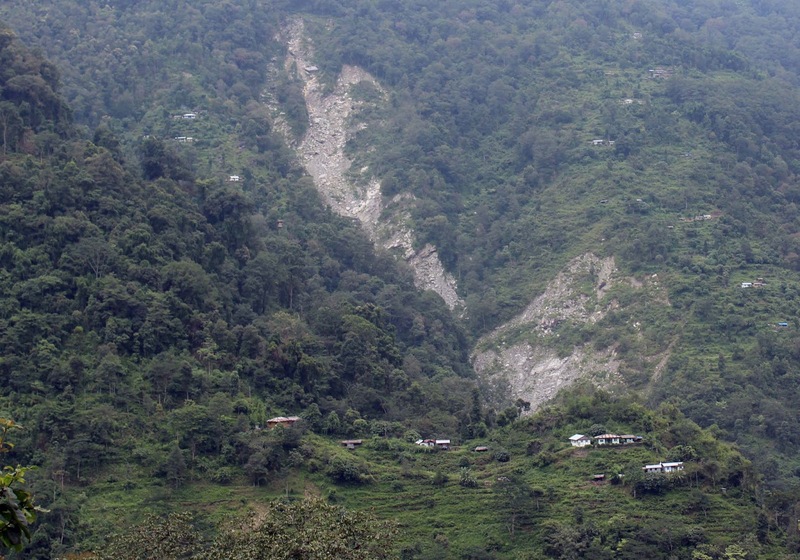 Meanwhile Sahadev Rai a farmer told last year landslide washed away the large cardamom farming which is a cash crop. He said we lived in relief camp for four month, our farming was washed away but during pujas we came back to our damage houses and again re started farming. He said the area has been regularly sinking which is posing a great danger to all area we even can’t sleep well when its rain heavily.Many Houses in the areas have been either hanging above the landslide areas or below.Many farmers in the area incurred heavy loss as the area is a good producer of Large Cardamom whose market price touches about 2000 per Kg. Last year between 30 June and 1 July, the Hills received about 227 mm rain in a few hours that left about 41 dead, eight missing and many injured. Apart from that, landslides affected many houses, villages and roads in GTA area.About eight people died in Kalimpong and five were left missing. The worst monsoon fury fell hard on many people who were worst affected and still are in trauma. Many areas which were hit by fatal landslides are still in the same condition. The relevant departments, due to lack of funds, are not in a position to do anything. GTA irrigation department executive councillor CP Poudhyal when asked about the rehabilitation of homeless people and landslide prevention work said that the GTA from its side sent a damage report to the Centre, which sanctioned the fund but the state government has not released it. Thousands of people, meanwhile, continue to live in a state of risk. 0 Respones to "Fear grip Kholakham villager following incessant rains"